disclosed losses of C $ 237.8 million on net revenue of C $ 54.2 million, after reporting a profit of C $ 7.7 million on sales of C $ 11.7 million a year ago. Large losses were expected due to a decline in marijuana-related equities last quarter, as Aurora has invested heavily in other companies in the industry and must track their performance as part of its earnings – Aurora said that those adjustments accounted for about $ 190 million its losses. The results reflect the launch of legal marijuana sales in Canada, the first industrialized nation to allow recreational-pot sales nationwide. Aurora claimed a large market share for Canada in the launch quarter, with $ 21.6 million of its revenue coming from its home country. "Based on available data released by Health Canada for the Q2 2019 period, Aurora accounted for approximately 20% of all consumer sales across the country, "Aurora said in its announcement. Aurora announced in January that it expected revenue of C $ 50 million to C $ 55 million, net of excise taxes. Not enough analysts cover the company for a worthy consensus estimate. Aurora shares bounced around in late trading, but mostly showed small gains of less than 2% after its numbers were released. Aurora's shrinking margin may be more worrisome than the stock-influenced quarterly loss. Aurora said its gross margin on cannabis sales shrank to 54% from 70% in the prior quarter and 63% in the year-ago quarter. Aurora stuck by its goal of showing adjusted profit in the fiscal fourth quarter, however, and said that the margin change should be temporary. "The decrease [in gross margin] was primarily due to a lower average selling price per gram of dried cannabis , the impact of excise taxes on medical cannabis net revenues, and a temporarily lower proportion of cannabis oil sales in the company's sales mix ratio. Also impacting gross margin were increased packaging requirements under the Cannabis Act and one-time ramp-up and optimization costs as our Sky facility was brought up to full production, "Aurora said in its announcement, referencing a marijuana-grow facility. "The company anticipates that the launch of new derivative product lines, once allowed under Health Canada regulations, will contribute to improving margins." Previously, Aurora earnings were boosted by its wide-ranging investments in other marijuana-related companies, but a downturn in pot stocks at the end of last year was expected to hit the company's bottom line in this report. That has not stopped Aurora from continuing to invest, including acquiring a medical-marijuana distributor in Mexico and investing in High Tide Inc. late last year, as well as announcing the purchase of one of the last independent members of the so-called "blessed eight" in January. 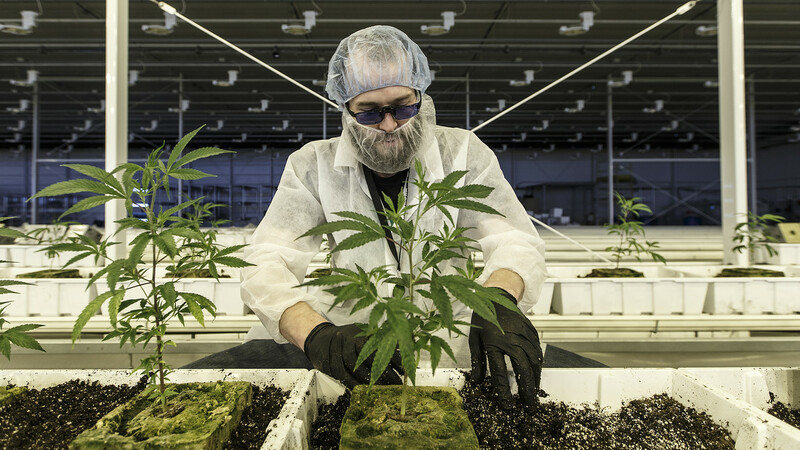 Pot stocks were largely lower Monday ahead of Aurora's earnings release. Canopy Growth Corp.